We are reaching the end of March Madness, the time of year when college basketball players have a chance to make their mark, both for their team and for the history books. But for the past decade, many of these players had their first chance at making their mark on the toughest grassroots circuit in the country - Nike’s Elite Youth Basketball League. On April 9th, 2010, Nike launched the modern-day 17-and-under Nike Elite Youth Basketball League. The club basketball landscape was striving for legitimacy and needing organization, and the world's biggest sports apparel company lived up to their 'Just Do It' mantra and shot their shot. Their reasoning for starting the youth league was a simple one; Nike wanted to provide some much-needed structure to an ever-changing grassroots basketball environment. The concept of the league was also fairly straight-forward: take the best prep basketball players in the country, and have them regularly compete against each other in a club basketball environment. From its inception the circuit was met with optimism from program directors and media alike, and it was an instant hit, featuring 52 of the top 60 ranked players in the 2011 class. The league just worked from the very beginning, and it becomes more popular every season. In order to understand the EYBL's impact in basketball, it's important to understand the league's setup, the talent level and its various accomplishments in the past decade. 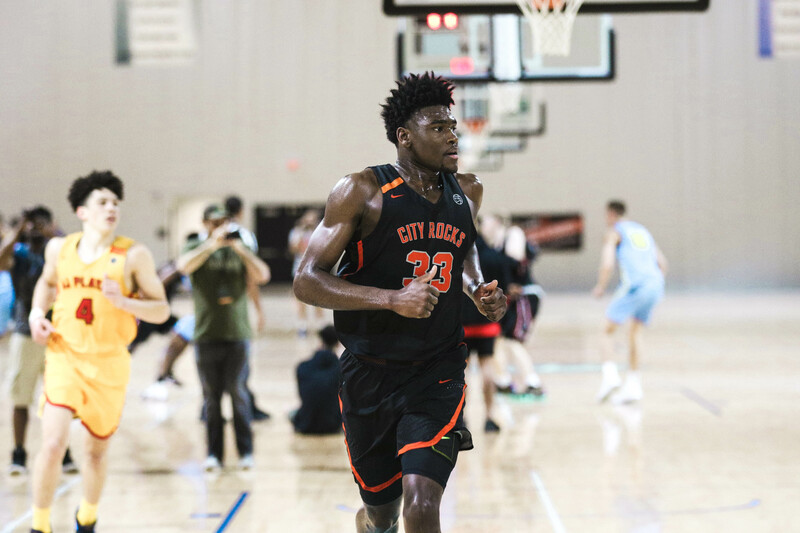 The modern-day NIKE EYBL is comprised of 40 teams across the United States and Canada, playing a 15-game schedule split between three regular season events in April and May. The teams are split into four divisions, with the top five finishers in each division receiving an automatic bid to the Peach Jam - Nike's fourth and final event in July. Often called the 'Super Bowl' of grassroots basketball, Peach Jam welcomes the top 24 teams to North Augusta, South Carolina to crown the king of grassroots hoops. Every Division I college team in America has a coach in attendance, and hundreds of media organizations apply for media credentials. Director of the City Rocks EYBL program in upstate New York, Jim Hart, supplied a great breakdown of the circuit. 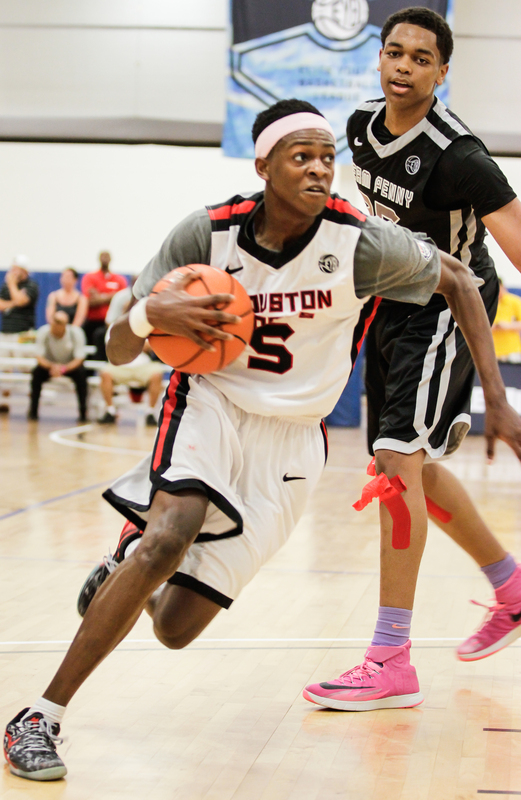 The teams have something to play for, a key component of the EYBL's success according to Hart. "The EYBL, at its launch, took a summer basketball system that was poorly constructed and fragmented and turned it into a league-based system, similar to the NCAA or NBA," Hart said. "Instead of playing for meaningless championships every weekend, teams are playing conference games where EVERY game counts in the quest to qualify for Peach Jam. There is only ONE trophy given to ONE Champion." To participate in the league, players must be under 18 at the start of Peach Jam in mid-July. Most athletes are high schoolers finishing up their junior years with select sophomores; freshmen can participate if they meet the rigorous qualification standard. The league features four 9-minute quarters, changing from two 18-minute halves in past seasons. A variety of other new rules are also being instituted for the first time in 2019: the shot clock will be moved from 30 seconds to 24, the international three-point line will be used, defensive three-second violations will be enforced, and zone defenses will be banned. The EYBL will essentially feature the same rules as the NBA, a clear sign that the NBA one-and-done rule is soon coming to an end. The games are played at a rapid pace, and coaches get a great look at how a prospect's game will translate to the next level. Each season, EYBL teams are required to designate a 'home' state. All rostered players must be from that home state or from a bordering state. This leads to some fairly aggressive recruiting battles, as each EYBL team is allowed to have three total players from bordering states. The NIKE EYBL will feature 90+ players ranked by 247 Sports in the 2020, 2021 and 2022 graduating classes and if a player is ranked in the top 100 by the major basketball scouting services, the odds are they will play in the EYBL. The EYBL is not for the physically or mentally weak. Games are fast and physical, and whistles don’t come frequently. You won’t find a faster brand of basketball, and the gyms are filled with players that are accustomed to being ‘the guy.’ The difference with the EYBL is that teams often have multiple guys on the roster that could be ‘the guy’, and it’s what makes it unique. 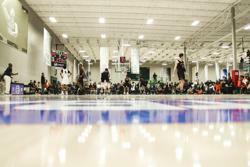 EYBL events are held on the weekends on Friday night, all-day Saturday and Sunday morning. The circuit will head to Atlanta, Indianapolis and Dallas, with each stop hosted at a state-of-the-art basketball facility. 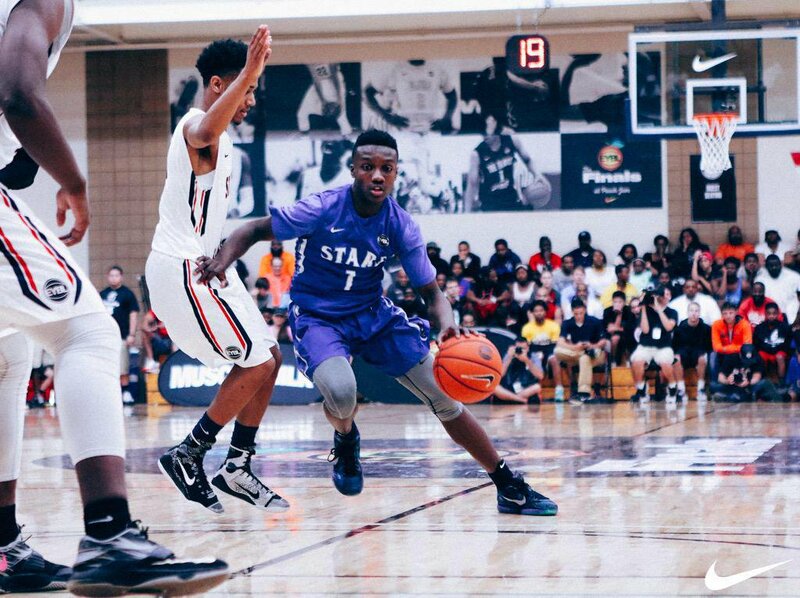 Watching basketball live at an EYBL event is quite the spectacle. Anywhere between six to ten games are going on at once, and there are future professionals on every court. It’s a hectic, energetic sporting environment featuring terrific crowds and palpable buzz. “Anyone who has witnessed an EYBL session or Peach Jam can attest to the quality of basketball, coaching and event management that they are witnessing,” said Hart. The first and last events are ‘open’ recruiting periods, meaning colleges and universities are allowed to be in attendance. Coaches line the sidelines by the masses, getting a first-hand look at the latest crop of recruitable talent. Video mixtape companies swallow up the baseline action, and hundreds of highlights get posted daily. 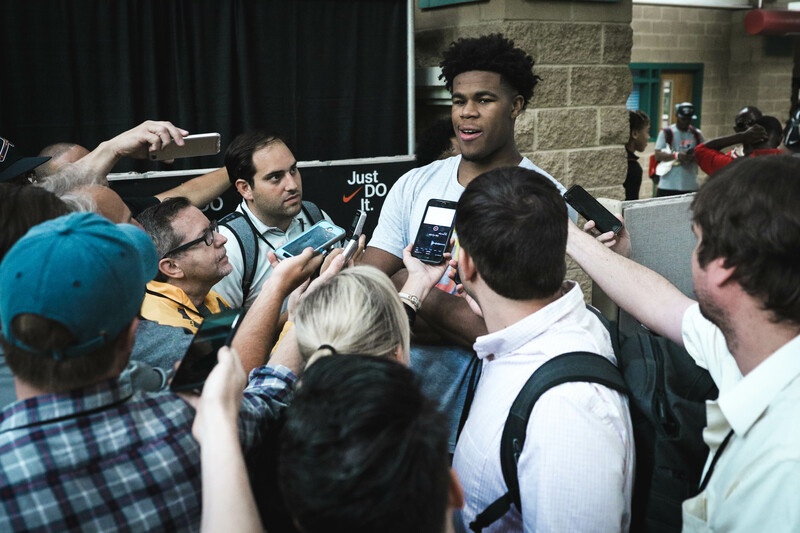 Star prospects get hounded by various media properties after each game, receiving countless questions about where they'll be attending college, and when they plan on committing. 128 EYBL alumni were featured on 2018-19 opening day rosters, all under the age of 25. Notable alumni in the NBA include Anthony Davis, Devin Booker, Brad Beal, De’Aaron Fox, Trae Young, Ben Simmons, Jayson Tatum and D'Angelo Russell. Every NBA team has at least one EYBL alumni rostered, with the Atlanta Hawks & Sacramento Kings leading the way with 7 EYBL alumni rostered a piece. Since 2012, the EYBL has seen 144 total alumni drafted into the NBA, averaging 20.5 each season. Even more have been added as undrafted free agents. The 2018 NBA draft was the most successful yet for the circuit, as 23 alumni were drafted in the first round, including 12 of the first 14. In the seven drafts that have featured EYBL alumni, five number one overall picks featured first in the EYBL. Seven more alumni are projected to be drafted in this years NBA Draft lottery. Not only does the EYBL provide a strong pipeline for the NBA, well known alums have also started sponsored programs. Beginning with Chris Paul who launched ‘Team CP3’ in 2011, Plenty of players have followed suit including Kevin Durant’s ‘Team Durant’, Russell Westbrook’s ‘Team WhyNot’ and Carmelo Anthony’s ‘Team Melo.’ 18-year NBA veteran Jermaine O'Neal started Dallas EYBL powerhouse Drive Nation after his retirement, and he mans the sideline as the head coach for the Dallas powerhouse. O'Neal created way more than just an elite basketball program in the first year in existence. 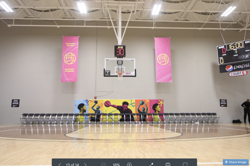 His Drive Nation Sports Facility is one of the best youth sports environments in the south, and it provides everything an aspiring basketball player needs to flourish in their development. The upcoming change to the NBA one-and-done will likely mean that the EYBL will be the highest level of talent these athletes will compete against before turning pro. With college no longer being a mandate, many players will be hoping to have their names called on draft night less than a year after competing at Peach Jam. Sacramento Kings De'Aaron Fox Attacking the Basket as a freshman for Houston Hoops in 2014. While the impact of the EYBL on professional basketball can’t be understated, it’s arguably had a greater influence on the college game. Nearly 97% of EYBL players continue on to play basketball at the next level, including 90% playing at the Division 1 level. Stellar performances can translate into scholarships and tuition assistance since hundreds of college coaches get the opportunity to watch them compete against other elite athletes. A good two-minute stretch in the EYBL can be enough to earn a scholarship offer for an underrated recruit. EYBL alumni aren’t just going to college, they are prospering on the court while they’re at it. 298 total alumni qualified for this year’s NCAA Tournament, most in league history. The rigors of playing in the EYBL have lasting effects. 24 alumni will participate in this weekend’s Final Four, highlighted by Auburn’s Jared Harper and Virginia’s Kihei Clark. Both undersized point guards started their journey in the EYBL, and both left with Peach Jam Championships. The 5-foot-11 Harper sparked his recruitment in a big way, dazzling as the point guard for a Georgia Stars team that featured Wendell Carter (Bulls), Udoka Azubuike (Kansas), Trent Forrest (Florida State) and Brandon Robinson (UNC). Clark took a different route to his current status as a sturdy floor general for the Cavaliers. The 5-foot-9 guard was originally committed to UC-Santa Barbara, but his recruitment skyrocketed after his series of performances at the 2016 Peach Jam, highlighted by a 18-point, 3-assist performance in the Peach Jam title game as the Oakland Soldiers beat over Team Takeover. That prolonged evaluation time paid off big time for Tony Bennett and Virginia, as Clark’s impressive play at Peach Jam allowed the Cavaliers coaching staff to find a diamond in the rough. A similar situation occurred with Texas Tech’s Jarrett Culver. The 6-foot-7 sophomore entered the 2016 NIKE EYBL as an unknown commodity, and he used the EYBL platform to burst onto the recruiting scene. Fast forward to today, and Culver is a projected top-14 pick in the NBA. Some teams recruit the EYBL with precision, evidenced by the roster of Final Four qualifier Michigan State. Led by Cassius Winston, Nick Ward and Xavier Tillman, Tom Izzo’s Spartans feature 11 circuit alumni on their roster, more than any other team in tournament history. The fact is, playing in the EYBL increases a player’s chances of succeeding at the college level. EYBL alumni account for 49% of the scoring (148.7 / 303.5), 44% of the rebounding (63.0 / 144.4) and 58.9% of the assists (36.5 / 62.0) between Texas Tech, Auburn, Michigan State and Virginia. The Family Detroit, Michigan’s EYBL affiliate, leads the EYBL with four alumni remaining in the tournament, all four playing on Michigan State. Courtney Williams, head coach of The Family, knows that playing in the EYBL is an advantage for all young players. "This might serve as a future model for how things may be done," Hart told Christopher Lawlor of ESPN in 2010. Hart couldn’t have been more correct. 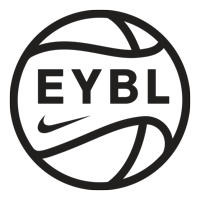 Capitalizing on their success in the boys realm, Nike entered the girls grassroots landscape five years back, launching the 32-team Girls EYBL. The model is very similar - bring the best talent in the country under the same roof and let them they battle it out. Once Nike launched their circuit in 2010, adidas and Under Armour weren’t far behind. The rival shoe brands currently operate the adidas Gauntlet and UA Association respectively, operating with similar models to the EYBL. Each circuit gets their share of talent, and according to Hart, it has improved the grassroots basketball landscape as a whole. Adidas and Under Armour offer a terrific option for grassroots basketball, and each circuit plays their role in the current landscape. According to Brown, no one does it better than the guys who did it first. After 10 years, the EYBL continues to attract elite-level talent, and the end result is an on-court product that never ceases to entertain. It’s clear that Nike and the newcomers have created a successful model for grassroots basketball and their continued growth and development will only increase the momentum. As far as The Family’s Williams is concerned, nothing compares to what the EYBL has built over the past decade. PSA’s Williams expanded, emphasizing the overall value of playing on the circuit. Hart spoke about the EYBL in 2010 with cautious optimism. Similar to several longtime directors in the EYBL, they’ve seen a bit of everything throughout the years. After 10 years, Hart had the chance to re-evaluate his opinion of the circuit, and he didn’t skip a beat.